Tajchy in Štiavnica are extremely popular among local as well as other visitors. Long ago miners built an incredible water scheme composed of sixty interconnected water reservoirs, supplying energy for prosperous mining. The story of this enormous waterwork is as fascinating as the harmonic placing of tajchs in the nature. Twenty-four of them remained, conjoined with nature. They are available for swimming in nature, boating and fishing, ice skating and romantic walks in winter. Only a 15-minute walk from Holy Trinity Square (Námestie svätej Trojice) separates you from Veľká vodárenská tajch of turquoise colour . Tajchs are beautiful water reservoirs created by people and harmonically ingrown into the steep hills. Tajchs were the solution of “the first energy crisis” of mining and they saved mining in the whole region. The energy produced by water replaced the horse and man power, which wasn’t sufficient for draining mines. Before tajchs were created, the water had been drained by approximately 2000 people and as many horses. In the 18th century, tajchs formed probably the most perfect water management system in Europe. In overall, they were able to collect 7 millions of cubic metres of water and distribute it to the places where it was necessary. The water was used for driving underground water pumps and machinery for processing iron ore, were the ore was crushed and washed. Residual water was used to drive mills. The water in a tajch was lead away by an underground tunnel; a “stopper” was controlled from a little hut built on a dam of the tajch, called “monk”. As there wasn’t any abundant stream in the area, tajchs were filled by rain water, collected by tens of kilometres of ditches. The technical solution of the complex structures still standing, as well as their management, deserve our admiration. Building the dam required simultaneous work of hundreds, even thousands of men and women. They had to bring earth to the place and the dam was trampled by flocks of sheep shepherded there. The energy base of this system gave rise to the mining draining machinery, which became a model for other mining regions in the world. 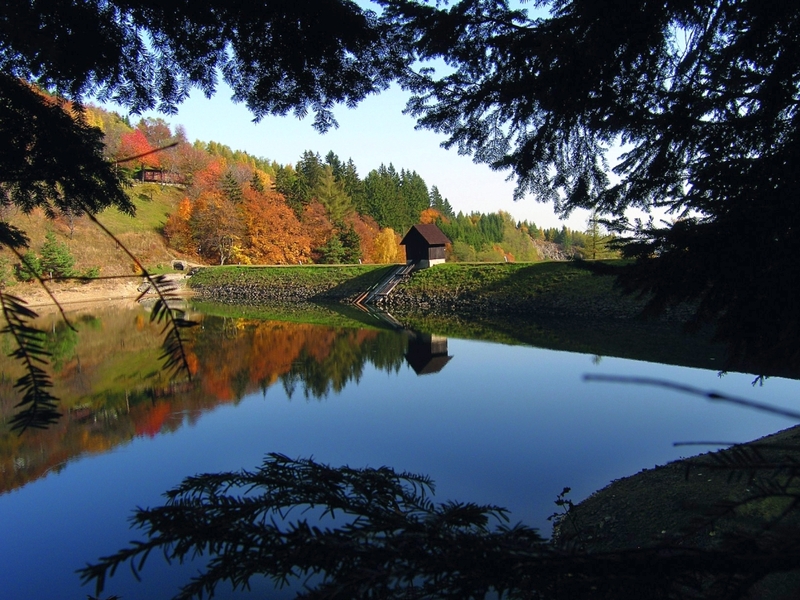 Tajchs is one of the reasons why Banská Štiavnica was included in the UNESCO’s World Heritage List. Twenty-four tajchs picturesquely set in the nature remained up to now. Some of them are used for relaxation: swimming and rowing in summer, skating in winter. In spring and autumn they are a good place where to go for a walk to. Veľký vodárenský tajch and Klinger are easily accessible when walking from Štiavnica. Počúvadlianske jazero tajch, Vindšachta and Richňava tajch in Štiavnické Bane and Kolpašský tajch in Banský Studenec are also suitable for families with children, as their sides are not so steep. Some parts of the ditch system were preserved, too. They are crossed by numerous pathways and cycle routes. Artificial water reservoirs are enjoyable for fishers, too. There are mostly carp and trout fishing grounds here. Počúvadlo tajch has a mode “Catch and let go”. Richňava tajch will have been reconstructed until September 2015.